India, Mauryan Empire. 321 to 187 BC. Size : 13.0 x 14.0 mm. Weight : 3.16 grams. Reference : I have not yet be able to figure out which Mitchiner type this is. 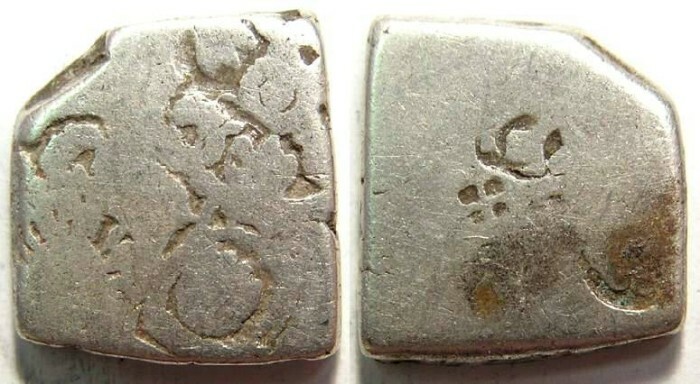 Reverse : A single punch mark. Mitchiner, in his series ORIENTAL COINS AND THEIR VALUES, attributes this to particular kings, but most experts in this field do not accept his attributions and feel that currently we simply do not know which kings issued which sets of punches.